Like all good theories, this idea sounds simple in such an overly simplified form. The greatness of Fama’s contribution does not lie in a complex “theory” (though the theory is, in fact, quite subtle and in itself a remarkable achievement.) Rather “efficient markets” became the organizing principle for 30 years of empirical work in financial economics. That empirical work taught us much about the world, and in turn affected the world deeply. Cochrane’s unclear references to “efficient markets” as theory/organizing principle/empirical work/empirical result/testable proposition/empirical prediction/theory with genuine content/ conceptual framework, together with recent discussions of the possible “death” of theory, suggest that a “theory vs empiricism” war is still under way. And such way of pitching the recent developments in economic science rely on a dangerous lack of articulation of what theory is, or has become. Last August, Noah Smith has suggested that over the past thirty years, theory has been displaced by empirical investigation. In his view, theory has been discarded by the growing body of evidence accumulated against standart decision theory by behavioral economists (Kahneman, Smith, Thaler, Camerer). Paul Krugman, who emphasized both a decline in theory (vs empirical) papers and a shift in the profession’s value structure, offered an alternative explanation: in the eighties, theory either began to account for virtually any phenomena (as in trade) or to support untrue facts (as in macroeconomics). Many observers pointed that the relative decline of theory was due to an explosion of empirical work in the wake of the increased availability of computing resources and data. The evidence for the death/decline of theory was to be found in the recent literature on economic publishing: Card and Della Vigna note that the absolute number of top-5 theory papers has fallen since the 70s, and that the citation count of post-1990 theory papers is falling relative to other fields, in particular development and international econ papers. Hamermesh demonstrates that, after a peak in the mid-eighties, top-3 journals publish fewer “pure theory” papers (but also fewer empirical papers based on publicly available data sets) and more empirical studies based of self-made data or lab/field experiments. In all these reflexions, including the nuanced picture of Tony Yates on macro, the fate of theory is assessed in relation to (and mostly in opposition to) the fate of empirical work. All the problem is, of course, how you define “theory,” and whether it’s legitimate to see it as the mutually-exclusive complement of empirical work. Smith seems to equate theory with” deductive method,” as opposed to inductive empirical work, and concludes that, with a few exceptions, “deduction is on the way out, and induction is on the way in.” Same ambiguity in the literature on publishing: Card and Della Vigna see theory as a field, while Hamermesh defines it as a methodology (see below). Card and Della Vigna classified JEL codes into 14 mutually exclusive fields, after the methodology outlined in Ellison’s 2002 paper. Both papers are scarce on definitions, but in both cases theory is defined in opposition to other methods or fields. 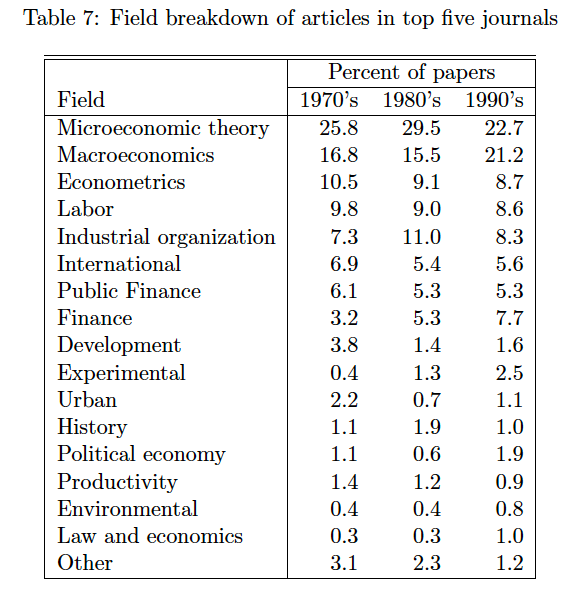 Note the unexplained rise of “theory” in JELcode non-mutually exclusive labeling of post-2005 economic papers. Card&Della Vigna and Ellisson’s classification systems, and thus their definition of “theory,” are thus home-cooked rearrangements of the JEL classification, which implies that they struggled to make consistent the pre and post-1991 JEL codes systems. The fact that they had to smooth a radical change in the way the AEA classifies economic articles signals a methodological problem: they perceive theory as an unchanging object, and the possibility that theory has “died” because the definition and practice of theorizing has radically changed never surface. And yet, in the new AEA classification — implemented under the leadership of JEL editor John Pencavel in 1991, the 1969 “theory” category has disappeared. For the most part, we have not divided theoretical and empirical economics into separate categories. This decision was made to accommodate, if not to encourage, articles and books that combine original theoretical work with empirical research. I read this sentence as a plea for stopping to consider theoretical and applied work as antithetical. The rise of computer resources and data may have changed the way empirical work is done, but also the way theory is conceived. Theory has become applied, and this can be read in many ways. The theorizing process may more systematically embody a concern with operationalization (or testability or whatever). With the possible consequence that less “only-theory” papers are published, an hypothesis consistent with the recent rise of “theory” JEL code labeling abovementionned. Or, theory has become applied in the sense that it doesn’t aimed at broad generalizations anymore, but at explaining a specific class of phenomena: why are cities structured the way they are? What is the taxation design that minimizes such and such deadweight loss? Is it possible to find a voting mechanism that is not manipulable? Is there any explanation of business cycle that relies on sticky wages/ sunspots/financial frictions/ non rational expectations ? Is such trend is at work, then theory may well have fragmented because it’s nowadays done very differently across fields.